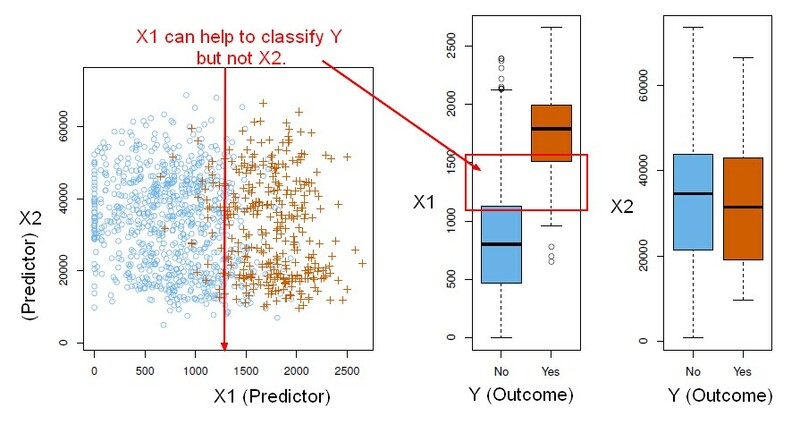 A classifier is a Supervised function (machine learning tool) where the learned (target) attribute is categorical ("nominal"). It is used after the learning process to classify new records (data) by giving them the best target attribute (prediction). Rows are classified into buckets. For instance, if data has feature x, it goes into bucket one; if not, it goes into bucket two. The target attribute can be one of k class membership. To summarize the results of the classifier, a Confusion matrix may be used. A multi-class problem has more than two possible outcomes. The classification task is to build a function that takes as input the feature vector X and predicts its value for the outcome Y i.e. C of X gives you values in the set C.
Often we are more interested in estimating the probabilities (confidence) that X belongs to each category in C.
For example, it is more valuable to have an estimate of the probability that an insurance claim is fraudulent, than a classification fraudulent or not. You can imagine, in the one situation, you might have a probability of 0.9 the claim is fraudulent. And in another case, it might be 0.98. Now in both cases, those might both be above the threshold of raising the flag that this is a fraudulent insurance claim. But if you're going to look into the claim, and you're going to spend some hours investigating, you'll probably go for the 0.98 first before the 0.9. So estimating the probabilities is also key. Logistic regression uses the conditional likelihood based on Pr(Y|X) (known as discriminative learning). LDA uses the full likelihood based on Pr(X|Y) (known as generative learning). Despite these differences, in practice the results are often very similar. Logistic regression is very popular for classification, especially when K = 2. LDA is useful when n is small, or the classes are well separated, and Gaussian assumptions are reasonable. Also when K > 2.
and Support Vector Machines (SVM). MaxEnt and SVM uses another mathematical models and feature weight selection then Naive Bayes. The feature are more weighed.